Marsha Berry writes on the cusp of anthropological investigation, poesis, and art praxis. Her writing is a self-aware and honest transaction with her reader. She does not want to overwhelm us with theoretical muscle but she does want to encourage us to think and do in ways that set us free from superfluity. She is a teacher above all and the book displays both insight and care for those who spend time in her company. Creating with Mobile Media investigates the convergence between locative, mobile and social media in order to show how people use mobile media for their creative practice—creative writing, photography, video and filmmaking. The central thematic focus of this book explores how mobile media has created new opportunities and contexts for creative practitioners. It draws together creative practice research with non-representational theory and digital ethnography to provide a fresh perspective on the place mobile media has in our everyday creative lives. Fictionalized and semi-fictional vignettes are used to present empirical material taken from fieldnotes and interviews to demonstrate how new forms and genres of art making have arisen because of the affordances of mobile media. The chapters in this volume have been arranged into a sequence according to the kinds of actions that make up various creative practices. 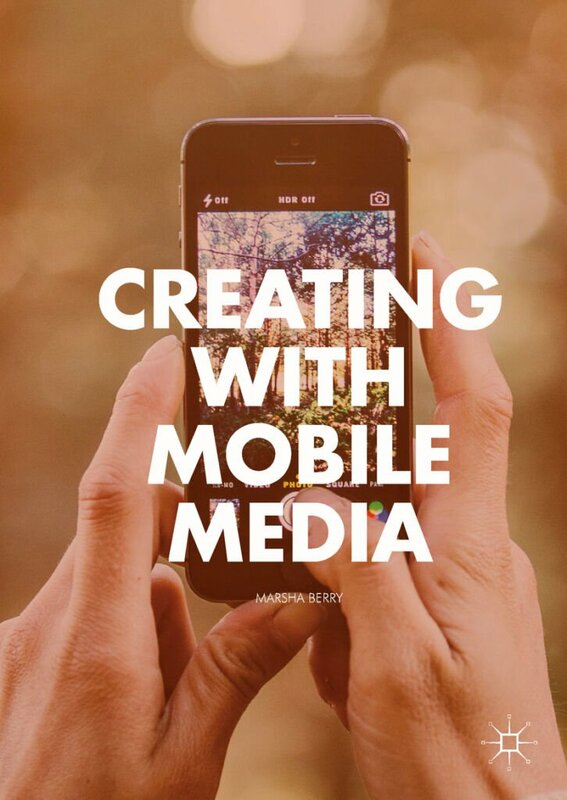 Creating with Mobile Media is a book that encapsulates the key paradigms of creative practice in a mobile world in a thought provoking, academically grounded and joyful approach to making personal, sharable art. Marsha Berry brings her deep insight and unique ability to cut through the jargon and situate creative practice in a context that can be understood by creative practitioners and theorists from fields including new media, cultural studies, literary studies, creative writing, screen studies and filmmaking. By sharing and interrogating her own creative practice via an accessible and deeply considered digital ethnological lens, Berry strikes new ground in the theorising of creative practice research in a mobile world. The smartphone as we all know is a vital part of everyday life in the 21st-century. Drawing on the image and practice of the wayfarer and “being there” and reflecting on her own mobile art in video, photography and poetry, Berry’s work stands as a key example of the seamless interrogation of creative practice in the academy. In Creating with Mobile Media, Berry brings fresh insight into the importance of the mobile phone as not only a means of communication but also a way of expressing ourselves, of thinking about and of making and sharing our art in an ever connected world. This is a timely and important book in a climate of increased recognition and valuing of creative practice research in the academy. Written by someone who not only knows this world, but also does this world, it is a rich, insightful and playful account of how mobile media are influencing the lives of creative practitioners—and how creative practices are emerging from mobile media users. A truly wonderful book for researchers and practitioners working across a range of disciplines, from anthropology to ethnography, and creative writing to screen production. Marsha Berry’s compelling new book explores the ubiquity of mobile mediaand its symbiotic relationship with human everyday practices and sociality. Berry argues that the networked and hybrid (online/offline) lives we now live provide new opportunities for extending both our creative practices and social circles, a digital futurism that is neither dysphoric nor utopian. This book is a powerful contribution to both creativity and ethnography scholarship, and simply a darned good read! Go buy it. Marsha Berry is Senior Lecturer in the School of Media and Communication, RMIT University, Australia, where she teaches digital media and creative writing. She is an ethnographer and artist whose practice includes video, participatory art, and poetry. She is co-editor of the book, Mobile Media Making in an Age of Smartphones (Palgrave, 2014). Marsha has published over sixty journal articles and book chapters on the topics of mobile media, memory and place, and creative practice research.